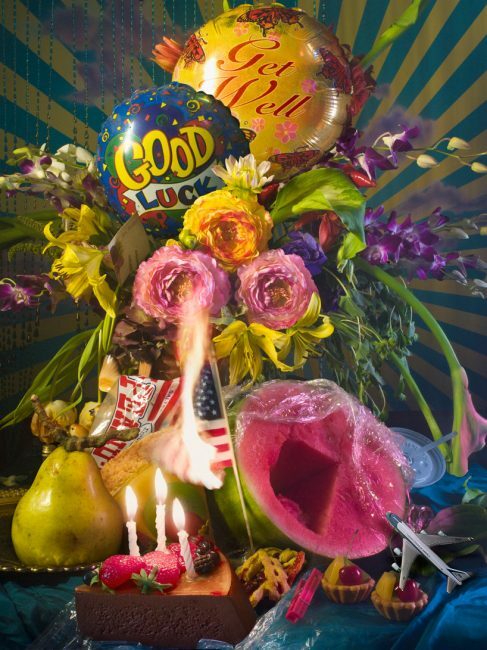 American photography David LaChapelle created Earth Laughs In Flowers in 2011, a series consisting of the large-scale still life photographs. 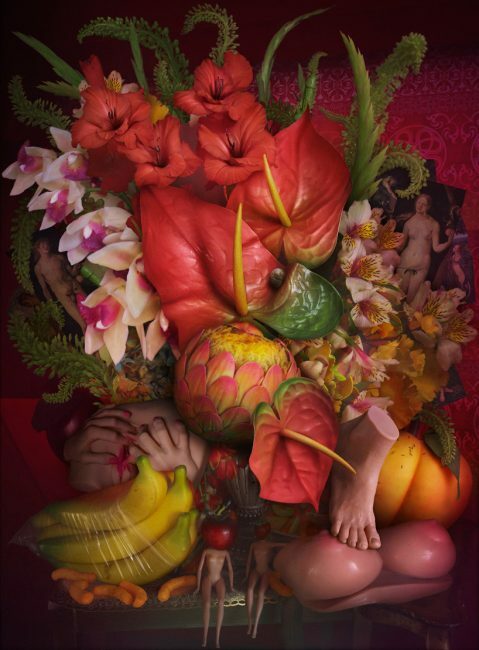 The works explores the fragility of society and ideas of vice and vanity through composing his images in a manner typical to that of baroque still life painting. The artist’s massive painterly-like photographs are intentionally chaotic, engaging the viewer as they attempt to reconcile the overwhelming canvas. The series title was inspired by Ralph Waldo Emerson’s poem Hamatreya, in which the earth’s flowers ridicule man’s arrogant belief that he holds permanent and indestruction dominion over the earth. Where are these men? Asleep beneath their grounds: and strangers, fond as they, their furrows plough. Earth laughs in flowers, to see her boastful boysearth-proud, proud of the earth which is not theirs; who steer the plough, but cannot steer their feet, clear of the grave. – Ralph Waldo Emerson. 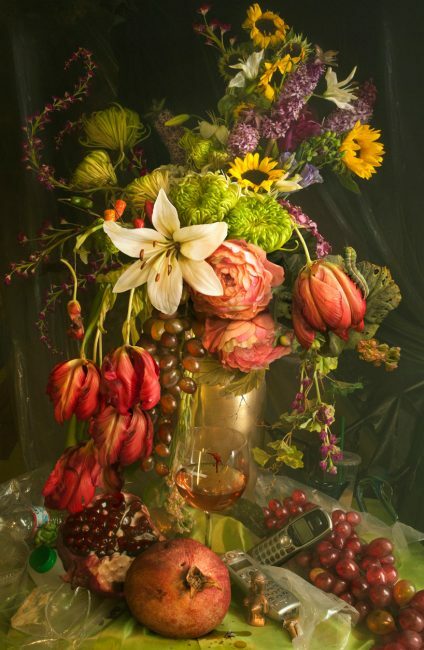 LaChapelle was inspired by his love for Old Masters and still life imagery – vanitas, and through this series he aimed to explore the brevity of life. At first glance the photos feature lush floral ensembles reminiscent of paintings by these Dutch Masters. He used this classical rhetoric to remind the viewer that humans are mortal and are only on earth for a short time. 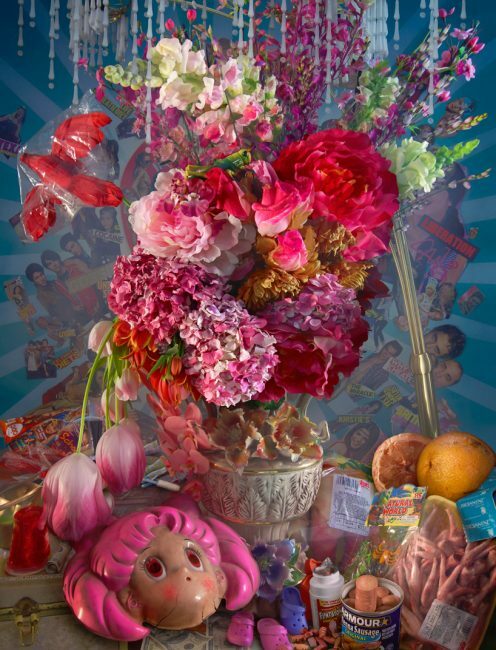 On further inspection, LaChapelle’s photographs also aim to invoke a contemporary dialogue by referencing the effects of celebrity culture, over-consumption and indulgence in today’s driven society. 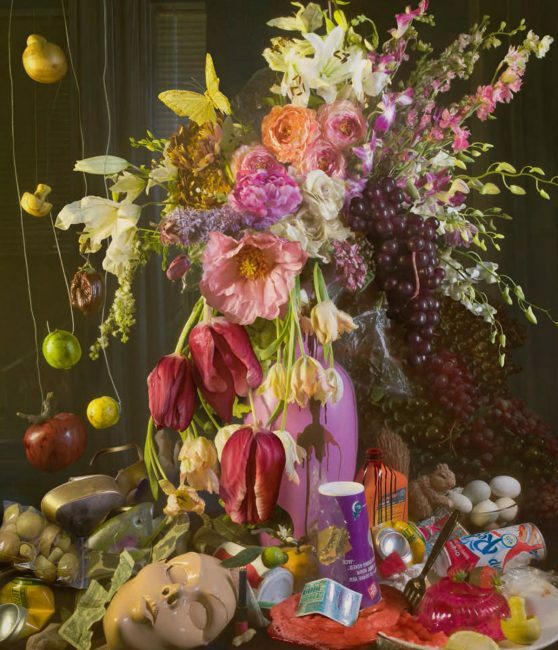 The artist combines the traditional motif of flowers with his personal dosage of contemporary kitsch incorporating items such as rotting food, mobile phones, pills, balloons and dolls. 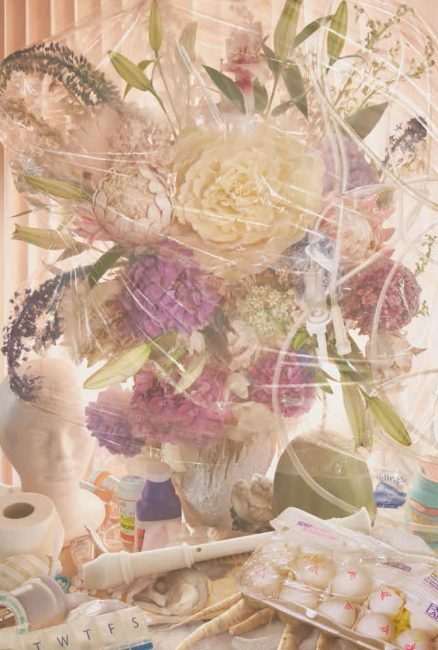 Guy Hepner is pleased to present David LaChapelle’s Earth Laughs In Flowers. Inquiry via phone or email to receive availability for editioned photographs by the artist.